Sewell's Point is a peninsula of land in the independent city of Norfolk, Virginia in the United States, located at the mouth of the salt-water port of Hampton Roads. Sewell's Point is bordered by water on three sides, with Willoughby Bay to the north, Hampton Roads to the west, and the Lafayette River to the south. It is the site of the Norfolk Navy Base. 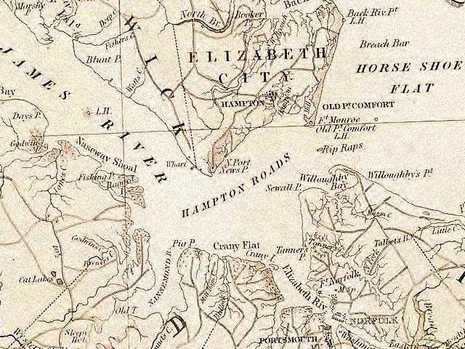 Sewell's Point’s location at the mouth of Hampton Roads proved to be a strategic location during the early portion of the Civil War. The first skirmish in Virginia, the little-known Battle of Sewell's Point, was fought on May 18-19, 1861, on ground now occupied by the US Naval Station Norfolk. The events leading up to the initial engagement on Virginia soil had moved with whirlwind rapidity. On December 20, 1860, South Carolina became the first state to secede from the Union. Four months later, on April 12, 1861, troops of that state opened fire on Fort Sumter in Charleston's harbor. Five days later, Virginia became the eighth Southern state to withdraw from the Union, and join the newly formed Confederacy. A few weeks later that spring, US General-in-Chief Winfield Scott proposed to President Lincoln a plan to bring the states back into the Union: cut the Confederacy off from the rest of the world instead of attacking its army in Virginia. His plan was to blockade the Confederacy's coastline and control the Mississippi River valley with gunboats. Lincoln ordered a blockade of the southern seaboard from the South Carolina line to the Rio Grande on April 19 and on April 27 extended it to include the North Carolina and Virginia coasts. On April 20 the Union Navy burned and evacuated the Norfolk Navy Yard, destroying nine ships in the process, leaving only Fort Monroe at Old Point Comfort as the last bastion of the United States in Tidewater Virginia. Occupation of Norfolk gave the Confederacy its only major shipyard and thousands of heavy guns, but they held it for only one year. CS Brigadier General Walter Gwynn, who commanded the Confederate defenses around Norfolk, erected batteries at Sewell's Point, both to protect Norfolk and to control Hampton Roads. The Union dispatched a fleet to Hampton Roads to enforce the blockade, and on May 18-19 Federal gunboats exchanged fire with the batteries at Sewell's Point, resulting in little damage to either side. Stewart's "History of Norfolk County, Virginia" (1902), contains a detailed account of the Battle of Sewell’s Point that took place one month later. "On May 18, 1861, Norfolk-area and Georgia Confederate troops began erecting land batteries at Sewell’s Point opposite Fort Monroe on Hampton Roads. By 5 o'clock that evening, three guns and two rifled guns had been mounted and work was rapidly progressing on the fortifications when the USS Monticello, commanded by Captain Henry Eagle, steamed over from Fort Monroe to see what was afoot. Not liking what he saw, Captain Eagle gave the order to open fire. One of the shots from his vessel hit the battery, throwing turf high in the air. In the meantime, the Monticello had been joined by an armed tug, also from Fort Monroe. The bombardment from these two vessels caused momentary confusion in the breastworks, but once the Confederates had recovered from the initial shock, immediate preparations were made to return the fire from their two 32-pounders and the two rifled guns already in position. In the absence of a Confederate or Virginia flag, Captain Peyton H. Colquitt of the Light Guard of Columbus, Georgia, who was in charge of the erection of the battery, called for the raising of the Georgia flag on the Sewell’s Point ramparts. Under the cover of darkness, the armed tug returned to Fort Monroe, but the Monticello remained off Sewell’s Point with her guns pointed in the direction of the Confederate fortifications". "During the night, frantic efforts were made to complete the breastworks, and it was not until the next day at around 5:50 in the afternoon that the bombardment was resumed. It continued until 6:45 p.m. In the end, the Monticello, with several gaping holes in her hull from well-aimed Confederate shots limped back to Fort Monroe. The first engagement on Virginia soil during the Civil War was over." There were no fatalities on either side. The only person wounded was a Confederate private who was struck by a fragment of a bursting shell. Subsequently the Sewell’s Point batteries were under fire many times, but they were never silenced or captured in combat. And, later, when Confederate forces evacuated Norfolk on May 10, 1862, they were abandoned. The famous Battle of Hampton Roads took place off Sewell's Point in Hampton Roads on March 8-9, 1862. USS Monitor of the Union Navy faced CSS Virginia of the Confederate States Navy. The battle, which was inconclusive, is chiefly significant in naval history as the first battle between two powered ironclad warships, which came to be known as ironclads. On June 5, 1862, President Lincoln, with his Cabinet Secretaries Stanton and Chase on board, proceeded to Hampton Roads on steamer Miami to personally direct the stalled Peninsular Campaign. The following day, Lincoln directed gunboat operations in the James River and the bombardment of Sewell’s Point by the blockading squadron in the five days he acted as Commander-in-Chief in the field. On June 8, 1862, Monitor, Dacotah, Naugatuck, Seminole, and Susquehanna by direction of the President "-shelled Confederate batteries at Sewell's Point, Virginia, as Flag Officer L. M. Goldsborough reported, "mainly with the view of ascertaining the practicability of landing a body of troops thereabouts" to move on Norfolk. Whatever rumors President Lincoln had received about Confederates abandoning Norfolk were now confirmed; a tug deserted and brought news that the evacuation was well underway and that CSS Virginia, with her accompanying small gunboats, planned to proceed up the James River or York River. It was planned that when the Virginia came out, as she had on the 7th, the Union fleet would retire with the Monitor in the rear hoping to draw the powerful but under-engined warship into deep water where she might be rammed by high speed steamers. The bombardment uncovered reduced but still considerable strength at Sewell's Point. The Virginia came out but not far enough to be rammed. Two days later President Lincoln, still acting as Commander-in-Chief, directed Flag Officer Goldsborough: "If you have tolerable confidence that you can successfully contend with the Merrimac [Lincoln and the North used the ships' former name] without the help of the Galena and two accompanying gunboats, send the Galena and two gunboats up the James River at once to support General McClellan." This division power afloat by the President silenced two shore batteries and forced gunboats CSS Jamestown and CSS Patrick Henry to return up the James River. On June 9, 1862, President Lincoln himself, after talking to pilots and studying charts, reconnoitered to the eastward of Sewell's Point and found a suitably unfortified landing site near Willoughby Point. The troops embarked in transports that night. The next morning they landed near the site selected by the President. The latter, still afloat, from his "command ship" Miami ordered the Monitor to reconnoiter Sewell's Point to learn if the batteries were still manned. When he found the works abandoned, President Lincoln ordered Major General Wool's troops to march on Norfolk, where they arrived late on the afternoon of the 10th. On June 10, 1862, Norfolk Navy Yard was set afire before being evacuated by Confederate forces in a general withdrawal up the peninsula to defend Richmond. Union troops crossed Hampton Roads from Fort Monroe, landed at Ocean View, and captured Norfolk. With the entire area back under Union control, the isolated batteries at Sewell’s Point lost their importance and were abandoned. For the remainder of the 19th century, the area was largely undeveloped and sparsely populated. The Battle of Sewell's Point took place from May 18-May 19, 1861 in Norfolk County, Virginia as part of the blockade of Chesapeake Bay during the American Civil War. Two Union gunboats, including USS Monticello, dueled with Confederate batteries on Sewell's Point in an attempt to enforce the blockade of Hampton Roads. The two sides did each other little harm. Two Union gunboats, including USS Monticello, dueled with Confederate batteries on Sewell’s Point in an attempt to enforce the blockade of Hampton Roads. The two sides did each other little harm.